The future looks conflagrant for Kevin Hope, the new fire marshal and director of Fire Services for Eddy County, and his enthusiasm and passion for not only the wellbeing of the county’s firefighters but also the safety of county residents won’t extinguish anytime soon. Hope plans to spark new ideas in his new position. Hope began his career in September 2004 as a firefighter with the Artesia Fire Department, where he progressed to captain and then division chief of operations and EMS. According to Hope, the fire industry is ever-changing due to technological advances and changes to safety regulations since he’s been involved. Firefighters are notoriously known to show family-like support to their fellow emergency responders. This is definitely the case for Hope. “There’s nothing that quite compares to a crisis or an emergency and working with people who are skilled, calm and able to handle that,” said Hope. “It is very much like working with a family… a dysfunctional family. It’s something that everybody has to say goodbye to at one point, either with retirement or moving on to another job. Hope says the work of a firefighter should never be done to receive validation. 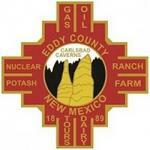 Artesia Fire Chief J.D. 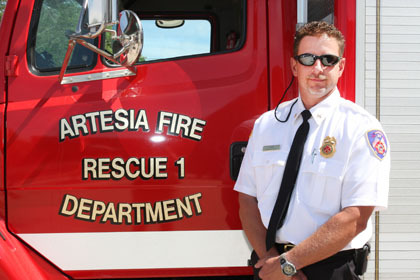 Hummingbird, whom Hope worked closely with during his time at the AFD, listed numerous accomplishments Hope achieved in Artesia. Hope also spearheaded the training tower; led the way in acquiring the air ambulance service, Tri-State CareFlight; led the first ever fire academy in department history; assisted the fire department in being awarded an ISO rating of 2, which only five departments of more than 360 in the state have attained; personally responded to more than 8,000 calls; was solely responsible for ensuring five ambulances and two new engines were built to specific specifications; and implemented the latest communications equipment and protocols. Hummingbird said he will miss seeing Hope around the Public Safety Comple, but is glad he was able to seize a new opportunity with the county. “I was truly saddened to lose Kevin, but I was happy to see him accept a challenge and further his career. Sad because he is an outstanding leader for our department, but even more because I consider Kevin a very close friend,” said Hummingbird. “There are a couple of good things about it. One, he hasn’t left the area so my friend is still near, and two, the Eddy County Fire Service has found an outstanding chief and leader.